They did just enough to edge out Boston Brute Squad. 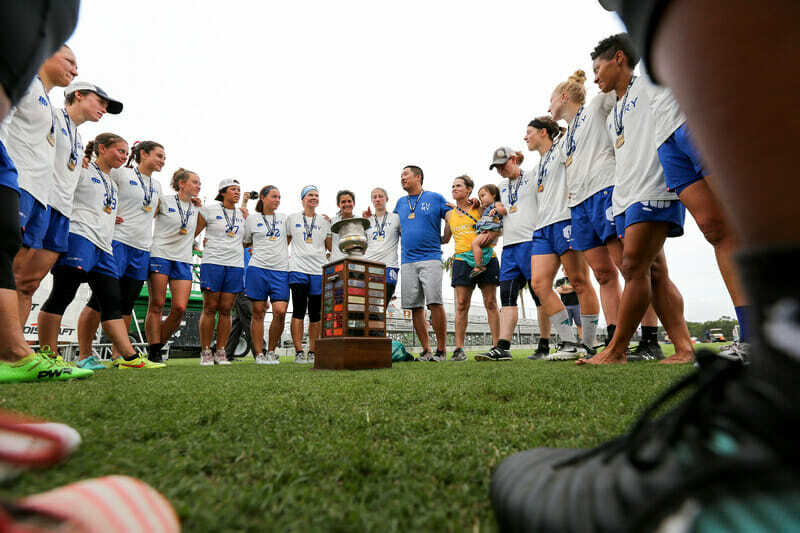 SARASOTA — San Francisco Fury returned both to Sarasota and the top of the podium, defeating Boston Brute Squad 14-13 in a thrilling final on Sunday afternoon. Despite trailing by three at halftime, San Francisco did just enough in the second half to earn their record-setting 10th national title, the most all-time in any Division. Fury had an inauspicious start. Despite looking like the best team in the wind all weekend, they were unusually inefficient in the game’s first points. They turned the disc over on five of their first six possessions, including some entirely unforced throwaways and drops. The errors allowed Boston to take a two break, 4-1 lead. Boston was the first elite defensive unit San Francisco saw all weekend, and Fury struggled through that initial acclimatization period. Really, they looked discombobulated for the entire first half. After an imperfect hold for 4-2, Fury got a break back to get back within one but gave up another break for 7-4. The poor start from Fury was surprising, as they’d started exceptionally well in every previous game on the weekend. Through the first half, Fury played just one point where they did not turn the disc over at least once. Brute Squad had five. The difference in sharpness between the two teams’ offenses opened up Boston’s 8-5 halftime advantage. But at the start of the second half, it was as if an entirely new Fury squad had taken the field, one that played much more like they had the rest of the weekend. Both with the disc and on defense, San Francisco was lights out. They played three perfect points to begin the half, including a seven pass possession that started one yard off the back of the endzone and a one pass possession — an inch-perfect forehand bomb from Lakshmi Narayan — for a break. San Francisco also improved their O-line defense in the second half. Trailing 10-8, Fury’s offense returned to giving away cheap turnovers. Bethany Kaylor had two drops and a throwaway, and Katie Ryan had a drop, but the whole team played impressive defense after the turn to get it back each time, including a big layout block from Ryan. Fury got the crucial hold to stay close at 10-9. In fact, San Francisco did not give up a break the entire second half. They also limited Brute Squad to just two turnover-free points in the second half, after having given up five in the first. Fury was playing much closer to their best ultimate as the final stretch approached. Both teams continued to force turnovers, but at 11-10, it was Fury that was able to get the key break. Immediately after saving a low throw with a layout grab one yard out from the score, Boston’s Kami Groom stepped out and low for a breakmark backhand, but the throw never got far enough off the ground to give her intended target a chance. Fury expertly worked the disc the full 70 for the break to tie the game for the first time at 11-11. Brute Squad answered with a clean hold, but, more importantly, they missed out on a break chance at 12-11. A Caitlyn Lee block on a deep throw to Lisa Couper earned Boston a chance to essentially put the game away. But Angela Zhu was forced to punt on a high stall, Kaela Jorgenson got an easy block, and Snyder finished to Couper for the hold. On the next point, San Francisco found the clutch play that Boston could not. Another redzone turnover from Boston, this time via Elana Schwam’s open side backhand into the endzone popping up and off the hand of Lien Hoffmann, gave Fury they chance they needed. Snyder boosted it to Narayan, who reset to Payne, who lasered a backhand to Diana Charrier just past a laying out Claudia Tajima. That was Fury’s third break of the half and their first lead of the game: 13-12, game to 14. Now able to work downwind, Boston held without a turnover for 13-13 to force double game point thanks to Cassie Wong elevating up and over Payne to reel in a floaty forehand from Zhu. Anna Nazarov, Claire Desmond, Cree Howard, Maggie Ruden, Snyder, Finney, and Couper on the line for Fury. Groom, Hoffmann, Zhu, Tajima, Becky Malinowski, Becca Ludford, and Jojo Emerson on for Brute Squad. It was as exciting and intense a moment as there is in the sport: double championship point. Double season point. After a poor Boston pull, San Francisco fired a couple easy throws to start the possession. Then there appeared to be some confusion as to what the mark was supposed to be, and Fury worked it right down for their easiest hold of the game. Finney found Howard for the team’s first National title since 2012. It was jarring to see a Brute Squad team surrender such an easy goal at such a time, marking an anticlimactic end to as good a game as one could hope for. But the point summarized the difference between the two sides in the second half. Boston was the better defensive team in the first half, and San Francisco was the better defensive team in the second. Fury’s offense was better in the second half, too, and their ability to score late breaks determined the outcome of the game. Boston head coach Ariel Jackson explained how a slight difference in his team’s first and second half performances made the difference. It’s a shame that they can’t play nine more times. Both teams played at a remarkably high level and put on one of the most entertaining halves of ultimate of the year. Fury was ever so slightly better. Their win put Fury as the all-time winningest team, as their 10 National titles surpass Lady Godiva’s nine. Snyder, Gen LaRoche, and head coach Matty Tsang all won their eighth championship after winning seven straight together from 2006-2012. Fury will look to defend their title next October closer to home in San Diego. Comments on "Superb Second Half Lifts Fury To Record-Best 10th National Title"